Bayou Classic Turkey Fryers are in stock at J&N Feed and Seed, just in time for Thanksgiving. Deep fried turkey is a Thanksgiving tradition in the Lone Star State and at J&N we’ve got just what you need to fry your bird to perfection. No dry turkey this year! J&N Feed and Seed stocks specialty outdoor turkey fryers manufactured by Bayou Classic of Brandon, MS. We currently stock several different sizes of turkey fryers including the 32 QT turkey fryer with rack, 80 QT Stock Pot with lid, 42 QT turkey fryer pot kit, and the Hi-Press cooker base. 32-Qt Turkey Fryer – . 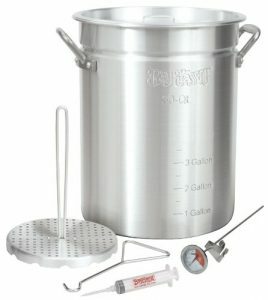 The Stainless Steel 32-Quart Stockpot allows you to fry a turkey in as little as 45 minutes. The indentation in the pot raises the basket 1.75 in. above the bottom for steaming or boiling seafood, crawfish, clams, and vegetables. 80-QT Stockpot with Lid – This Commercial Strength Aluminum Stockpot features a Vented Lid, Heavy Duty Riveted Handles, and a Perforated Basket. 42 quart Grand Gobbler Turkey Fryer – The 42-qt grand gobbler is specifically designed to fry your larger Thanksgiving Turkey to 25 lb. Stainless Steel High-Pressure Cooker Base – The 3 leg design provides a sturdy base and raises the 14-inch cooking surface to 21 Inch tall. It features an all welded stainless steel design with a powerful 4 inch cast iron burner. This entry was posted on Wednesday, November 16th, 2016 at 9:52 am	and is filed under News & Updates. You can follow any responses to this entry through the RSS 2.0 feed. Both comments and pings are currently closed.